HELSINKI—Rescue workers off Norway’s western coast rushed to evacuate 1,300 passengers and crew from a disabled cruise ship by helicopter on Saturday, March 24, winching them one-by-one to safety as heaving waves tossed the ship from side to side and high winds battered the operation. 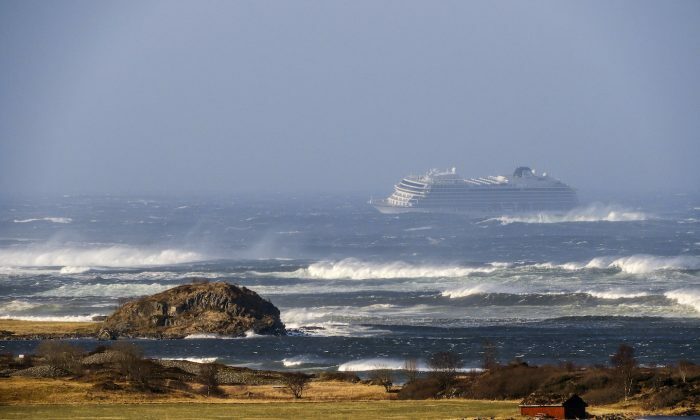 The Viking Sky issued a mayday call as bad weather hit and engine problems caused it to start drifting toward the rocky shore, the Norwegian newspaper VG reported. One passenger posted a video of furniture rolling around on deck as the 47,800-gross tonnage cruise ship was pounded by rough seas. Police in the western county of Moere og Romsdal said the crew, fearing the ship would run aground, managed to anchor in Hustadvika Bay, between the Norwegian cities of Alesund and Trondheim, so the evacuations could take place. Viking Sky told The Epoch Times it would issue updates of the rescue through its website, and that all 1,300 passengers would be winched off the vessel before the cruise ship is brought back into port. “The ship is proceeding on its own power and a tugboat is on site,” the most recent update at the time of writing said. “I was afraid. I’ve never experienced anything so scary,” Janet Jacob, among the first group of passengers evacuated to the nearby town of Molde, told Norwegian public broadcaster NRK. Fjeld said rescuers were prioritizing the nine crew members aboard the Hagland Captain cargo ship but later said they had all been rescued after jumping into the ocean and the helicopters had returned to help the Viking Sky. He said that with two more of the Viking Sky’s engines now in operation there is the possibility of sailing, although a spokeswoman told The Epoch Times that the ship would not be sailing to shore until all the passengers had been evacuated. The ship was visiting the Norwegian towns and cities of Narvik, Alta, Tromso, Bodo, and Stavanger before its scheduled arrival Tuesday in the British port of Tilbury on the River Thames.